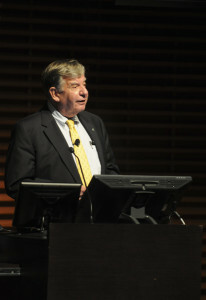 His presentation, part of the annual Tanner Lectures on Human Values hosted at nine universities across the world, set out to explain causes and present solutions for what he considers the dire economic threats stemming from the increasing costs of higher education. “Context matters,” he said to begin Wednesday night’s lecture, titled “The Productivity Problem in Higher Education.” He then summarized the aspects of higher education economics that he believes are most damaging, drawing attention to the challenging long-term upward trend of educational costs. “I documented the seemingly inexorable tendency for institutional cost per student to rise faster than [inflation] over the long term … an underlying pattern which has been found to hold for public as well as private universities and colleges,” he said. Rising costs at the richest top-tier universities put unsustainable pressure on the entire system of higher education, but, according to Bowen, these universities also have the power to reverse that trend. He called for universities to take initiatives against their institutional instinct and short-term individual interests in favor of social good. He made it clear that he did not envision a major shift from the traditional college setting to an online system, but hoped for a mix of both. Still, he maintains that online learning must have a role in all colleges and universities, public and private alike. Indeed, over the course of his two lectures, Bowen emphasized the necessity of top universities adapting to new models of education. “As the technologies grow increasingly sophisticated and we learn more about how students learn and what pedagogical methods are better in different fields, even top-tier institutions will stand to gain with the use of such technologies to improve student learning,” he said. His closing reflections emphasized the need for patience in finding a solution. Bowen argued that, when faced with problems we cannot answer, we must buy time to let ourselves adapt and find a solution. “[That] is the job of the Stanfords of the world,” he said.